In this chapter, we address how we developed our practical understanding of GPS. We look at how we investigated the characteristics of the technology, and how we began to find ways for explaining it to ourselves and others. The textbook explanation of how GPS works is relatively simple (El-Rabbany, 2006). A network of GPS satellites circle the earth in known orbits. These satellites send out radio signals that can be interpreted by devices with GPS receivers, such as smartphones. A GPS-equipped phone locates itself by listening to the radio signals and measuring the distance between itself and the satellites. This makes it possible to calculate the position through triangulation. The radio signals from GPS satellites have a high frequency, meaning that they get easily blocked. 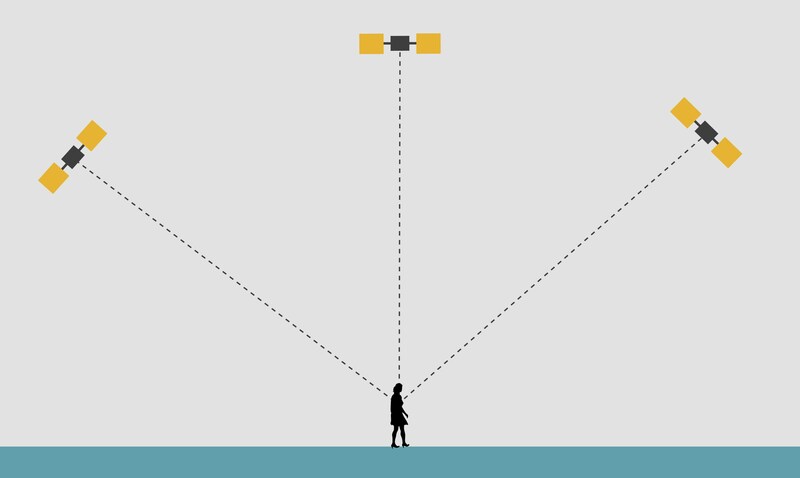 To be able to receive a signal we typically need line of sight to the satellite. This means that wide open spaces are ideal for good GPS accuracy. The more satellites we can see, the better the accuracy. 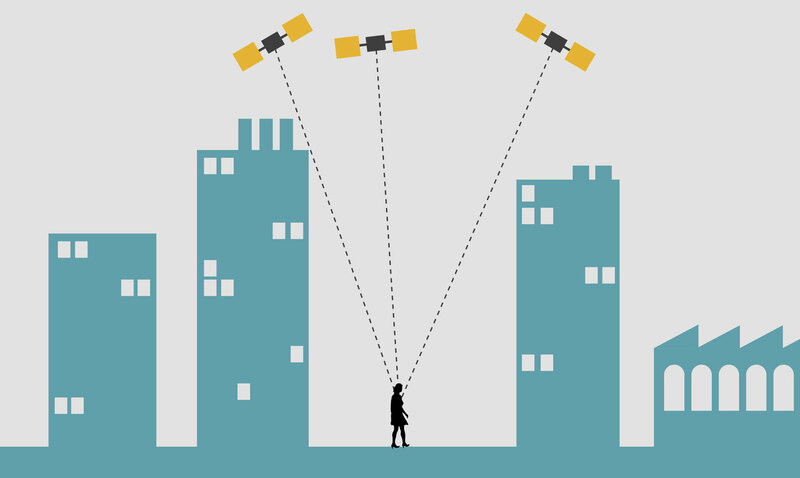 GPS radio signals are blocked by buildings, so the accuracy is therefore poorer in built up spaces, a phenomenon called GPS shadows. But GPS accuracy is also dependent on satellite geometry, or where in the sky the satellites are. Signal strength is strongest when they are far apart, and decreases as they move closer together. The accuracy of GPS depends on many factors, from weather to magnetic variations caused by solar storms. These are amplified by satellite geometry, meaning that where the satellites are in the sky affect the accuracy. Because satellites move across the sky relatively quickly‚ about 20 minutes from horizon to horizon‚ the constellation of satellites is continuously changing which are further challenges to the accuracy of the signal. The accuracy of GPS is shaped by the city, by how the sky is obscured, by how signals are reflected by buildings, and by how we move. 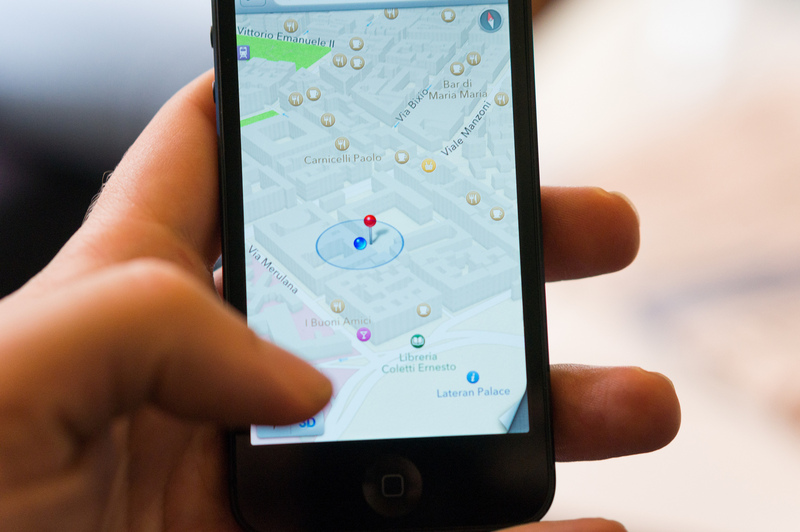 Using GPS on smartphones while out and about in the city means that the position reported by the smartphone is anything from ten to hundreds of meters off. The problem of GPS accuracy is one of the key qualities of the material of GPS. Exactly how the shifts in accuracy works, and how they are shaped by the urban landscape is both interesting and difficult to understand. A textbook explanation gives us a set of cautions about how GPS might not work in urban areas, forests or where our view of the sky is constricted. They tell us that operating in these “GPS shadows” might lead to poor GPS accuracy, meaning how far off the reported position might be. Although these limitations are noted, the textbook understandings do not give us a contextual understanding of how GPS really works in the city. 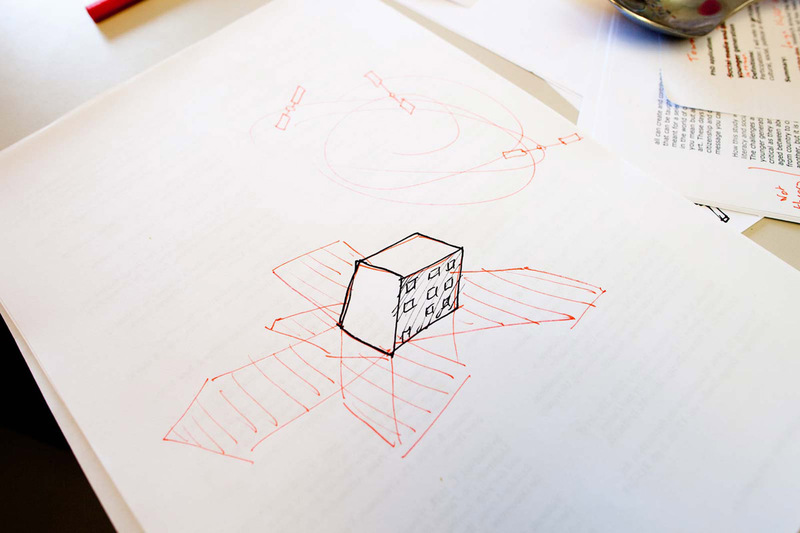 September 3, 2009: An early drawing showing speculations of what GPS shadows might look like. At this stage in our research, we became very curious about the shape and size of GPS shadows. They seemed like a key quality of the technology that defined so much of the way that GPS behaved in the city. So our investigation turned to asking three related questions: How do urban environments actually shape GPS accuracy? How big are the changes and where do they occur? How can we go about exploring these aspects of GPS accuracy? In order to develop an understanding of GPS, we had to quickly get our hands dirty with the fundamental phenomena of GPS systems. We didn’t want to just do analyses of consumer electronics, or to study the phenomena through the lens of Apple’s or Google’s highly abstracted software and Application Programming Interfaces (APIs). We had to get into the underlying hardware in order to really study the phenomena itself. Just a few years ago, GPS hardware was typically industrial or military. To work with it as a designer you would need the assistance of a specialized engineer. However, today GPS hardware has become a part of the platforms of interaction design. 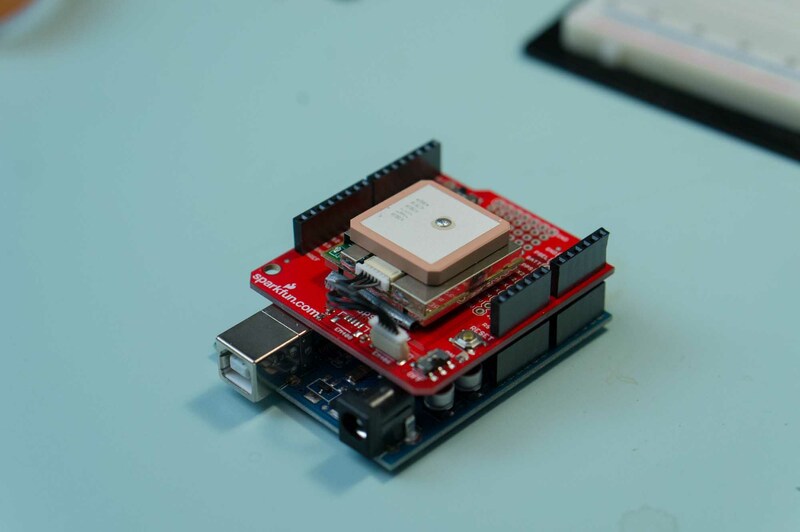 Electronic prototyping platforms such as Arduino and retailers such as Sparkfun give us access to specialized GPS components at a relatively low cost. 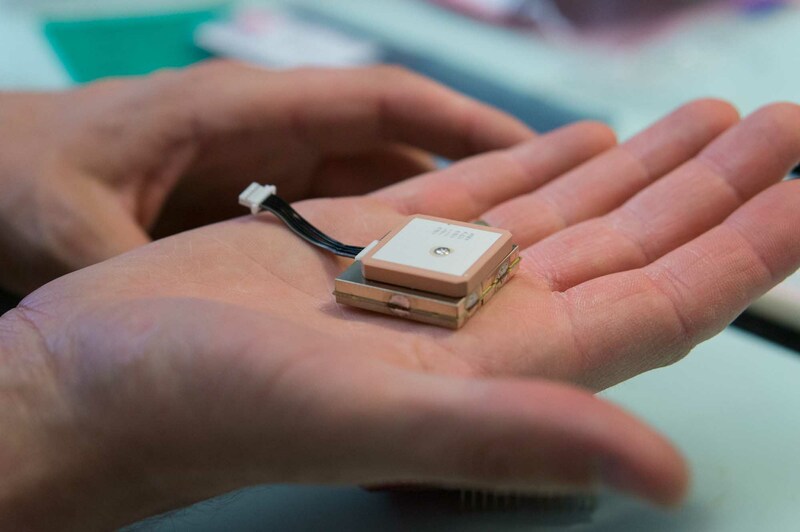 Together, they have lowered the threshold for exploring and tinkering with GPS hardware. They let us develop using these systems at a much lower level of abstraction than we would, for instance, using a smartphone Software Development Kit (SDK). This is a standard, low-cost GPS receiver, a 20 Channel EM-406A SiRF III Receiver with Antenna made by USGlobalSat. 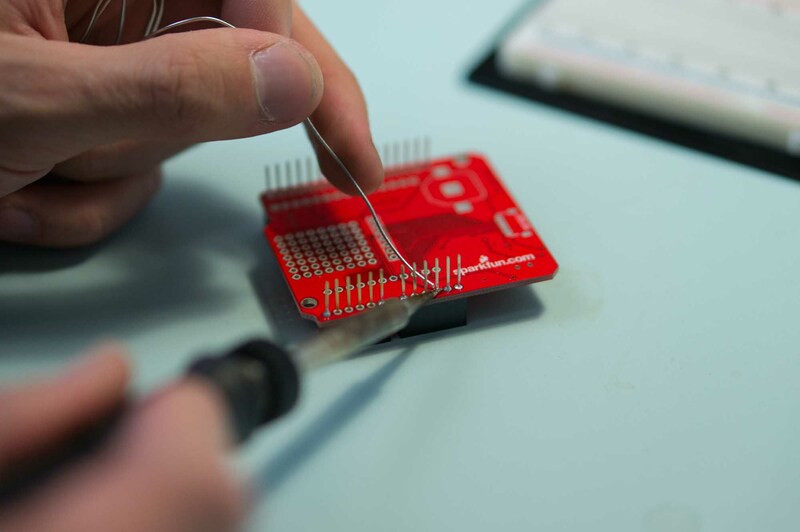 To be able to more easily work with the EM406, Sparkfun has developed a board that interfaces between the GPS component and a standard Arduino microcontroller for prototyping. Working with new technologies requires a highly developmental, learning-driven practice. The communities of practice around these engineering activities have become more open and inclusive towards hobbyists, designers, and artists. Much of the knowledge and resources needed to develop with these technologies are shared online, often spread across many sites: from commercial vendors, to forums, weblogs, and wikis. Developing with these technologies would not be possible without a literacy of how to engage with these online community resources. As well as constructing and connecting GPS hardware, we had to familiarize ourselves with the data that these GPS components provide. GPS is developed with very specific needs in mind, mainly navigation, and by looking at GPS data at a low level, we started to see how the data protocols had been constructed. 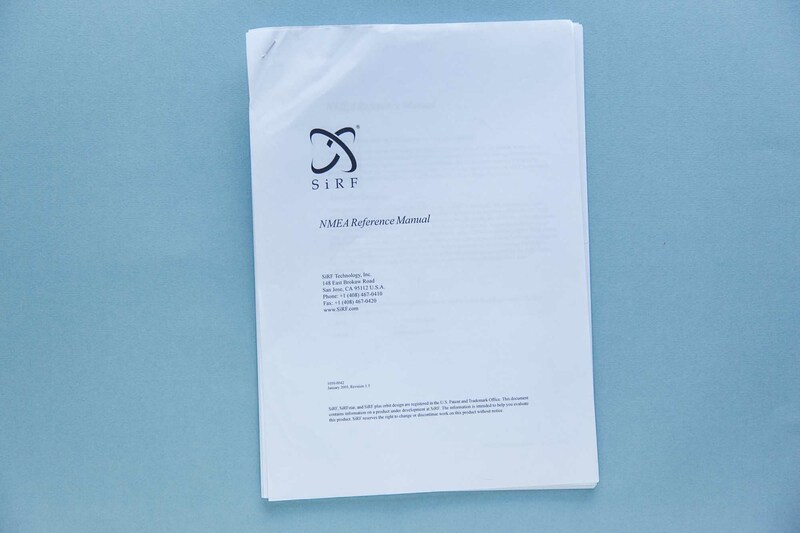 This is an National Marine Electronics Association (NMEA) protocol reference manual. NMEA is one of the standard protocols for working with GPS data. The manual gives us a detailed set of parameters for using GPS for a range of applications. 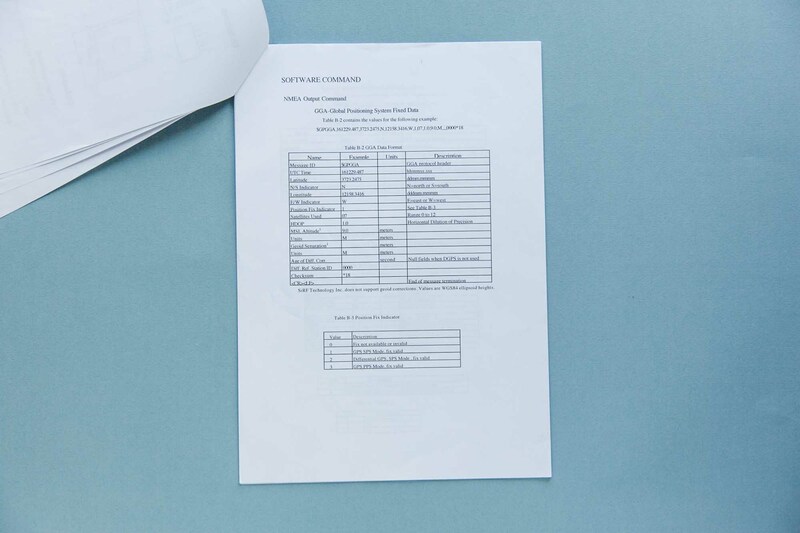 The NMEA manual gives us a guide to understanding GPS data, which are represented as comma-separated lists of data. NMEA data is optimised for navigating boats at sea, so it includes data formats such as “heading” and measures all speed in “knots”. 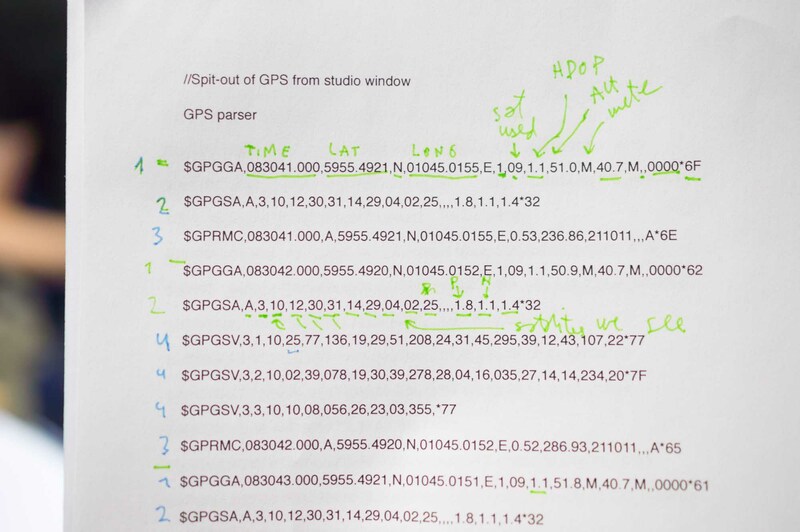 This is a printout of GPS data captured by our GPS hardware running in the window of our design studio. 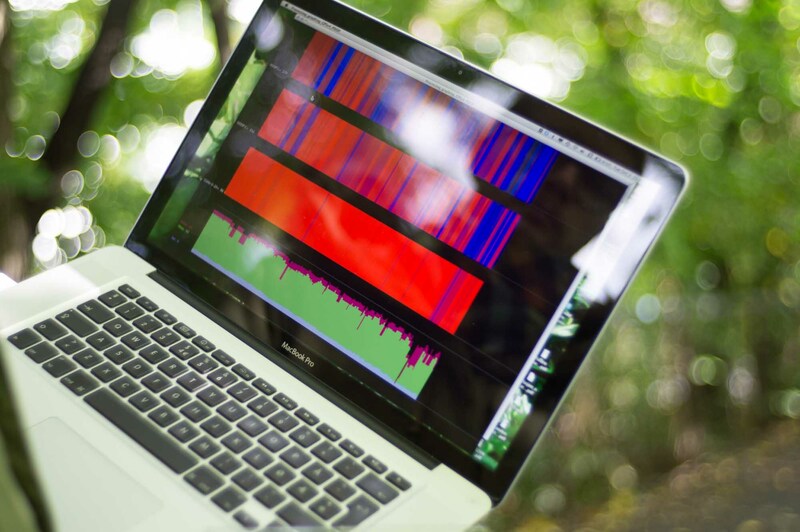 The data is gathered by a piece of software that allows us to collect the GPS data and print it out in its raw form. 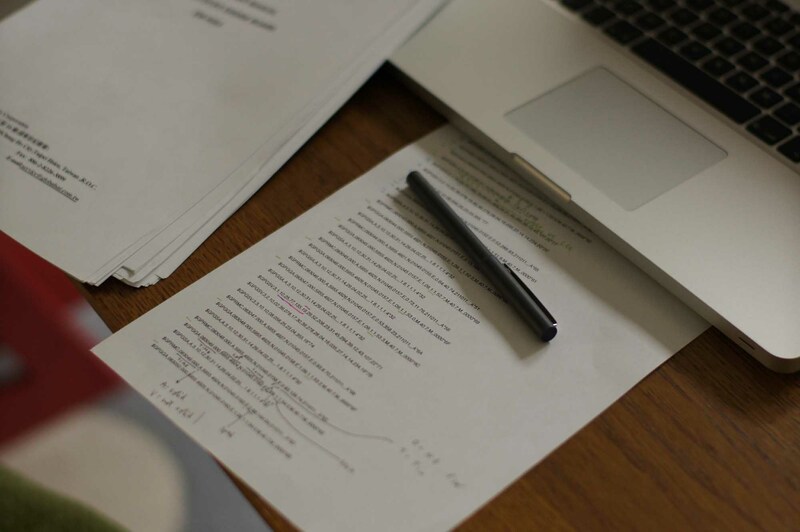 Every number and every comma contains meaning, analyzed by hand, on paper. To be able to work with it we have to write software that can parse or sort this data. What we are looking for in this data are the parameters that tells us about the uncertainty, or accuracy, of the GPS signals. The most common use of GPS data is to calculate a position: latitude and longitude coordinates, and often to also infer speed and direction. To perform these calculations, a GPS unit also makes use of many supporting parameters, such as the number of satellites in view, their angle above the horizon, satellite identification, and the information about the timings of these signals. When going through this data, we were specifically looking for data that could tell us something about GPS accuracy‚ how accurately the device could locate itself. Of particular interest were parameters called dilution of precision (DOP) which tells us how much the fluctuations in satellite geometry dilute the accuracy of position (Misra & Enge, 2011). When satellites are far apart, their geometry is strong, giving us good triangulation and a low DOP value. When the satellites are few, or close together, we have weak satellite geometry, poor triangulation, giving us a high DOP value. Roughly speaking, we can say that the DOP value is represented by the blue radius of uncertainty that surrounds the dot that positions us on a smartphone map. An Apple iOS map showing the blue radius of uncertainty. The radius of this circle attempts to show us the horizontal accuracy or error, which is highly influenced by the dilution of precision. DOP is important because it amplifies other inaccuracies in the system, such as errors in atmospheric conditions, shadows from buildings, and the position of satellites. 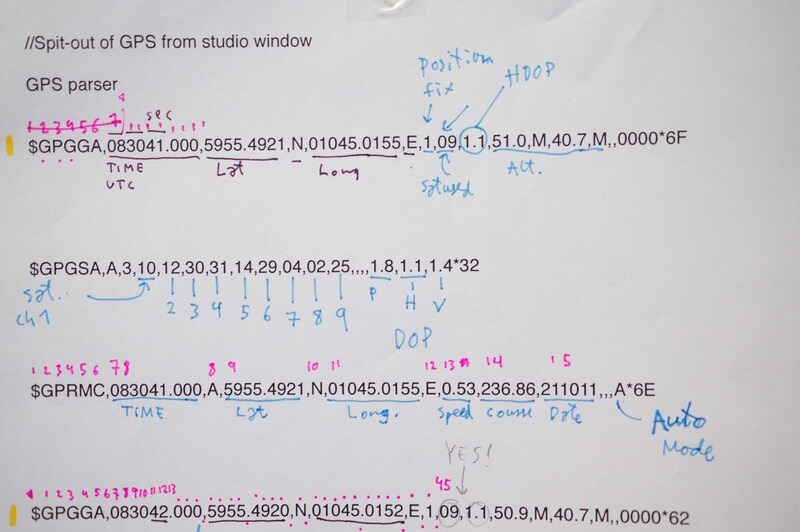 It was only by going through these protocols by hand, using paper and pen, that we were able to find out that DOP is a key factor in determining how GPS behaves in urban settings. Exploring and measuring DOP in different places and at different times could give us an indication of the accuracy of GPS positioning. In order to explore and make sense of how the data changes throughout the city, though, we needed to build quick and simple tools for visualizing them. The first output of our process was a piece of software that graphed DOP values in real time. 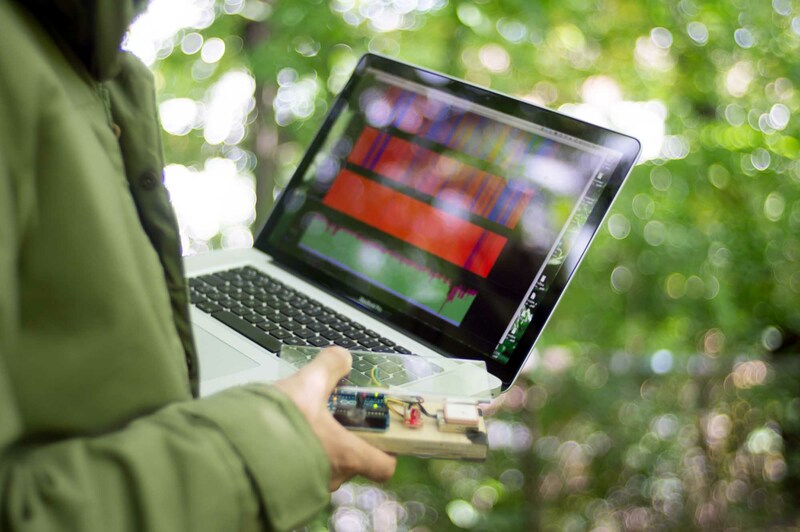 Combined with a laptop and a mobile GPS probe, we were able to walk around the city seeing the live data and the responses to the environment at a detailed level. The gallery below depicts this process in more detail. 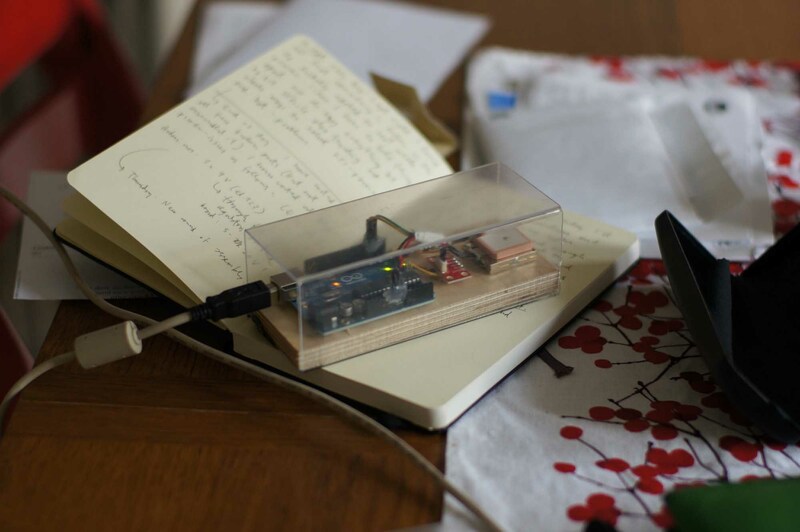 This is a GPS receiver connected to a microcontroller that sends data to a piece of software running on a laptop. It is a quickly designed tool, a transparent plastic box that that allows us to observe the performance of the electronics, and still mobile enough to carry in hand or a backpack. 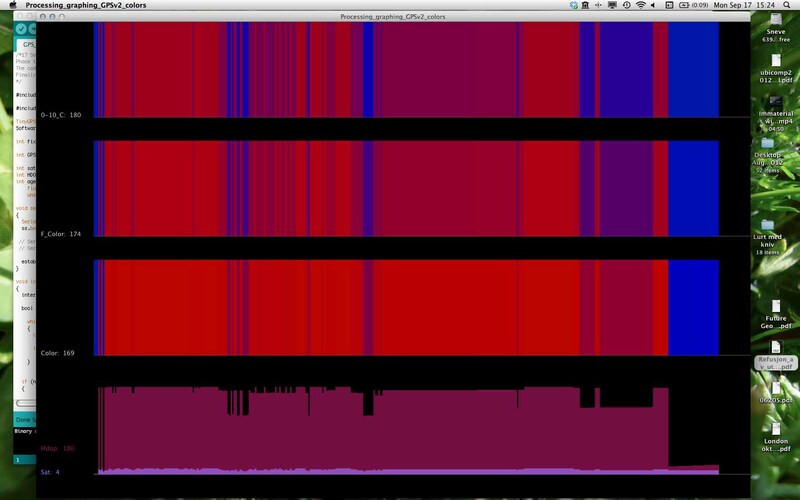 This is a screenshot of a piece of software written in the open-development environment processing that visualizes DOP values over time. The colors here represent different mappings for visualizing GPS data. 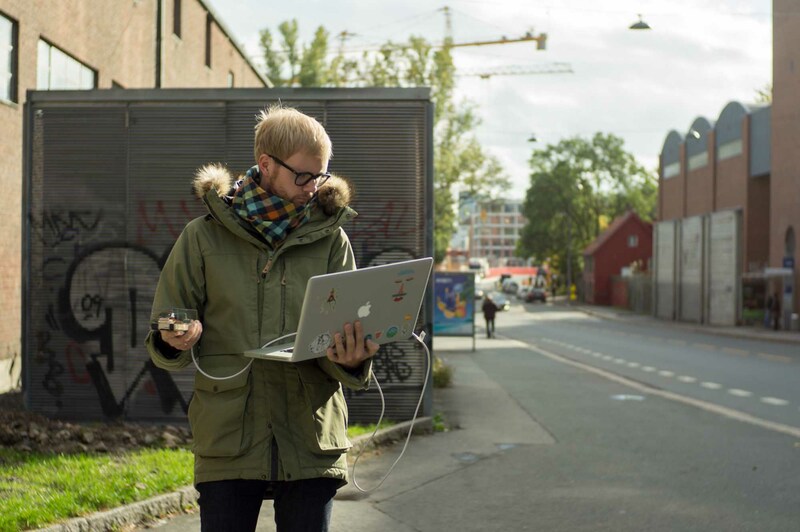 In our brief, we set up the challenge to visualize GPS in urban, everyday environments. So, we needed to quickly take our instruments out into the city. The graphing software let us get a rudimentary understanding of how GPS behaves across different urban environments. The graphing software, and the instrumental visualizations that it produced, was valuable both for learning how to work with the data, but also as a shared object for drawing together the team at an early stage. The visualizations worked as boundary objects (Star & Greisemer, 1989), allowing us to have a shared insight, to collaboratively develop concepts for visualizing GPS. This grounded the project in a finely grained knowledge of the technology, rather than speculations of its theoretical implications. The theory of GPS is technically well described. The textbooks tell us how the system is supposed to work in general. However, this doesn’t tell us about the system’s specific effects in local contexts. In other words, a basic overall knowledge of the GPS system is not enough for understanding or describing how GPS takes place in everyday urban life. In interaction design, our materials are often digital, and treated as intangible, or immaterial, although they “have distinct physical qualities that define how they perform, function, in opening up for or constraining interactional possibility” (Arnall, 2014, p. 4). Part of our interaction design research is in exploring and revealing these immaterials so that we might understand, use, critique and develop with them. In this case, we were not interested in the typical uses, abstractions and interpretations of GPS, such as providing latitude and longitude for positioning on maps. Instead, we focused on the lower-level phenomena of GPS signals and protocols, and how they behave spatially, in context. What we have presented in this chapter is a way to engage with technology directly through an initial conversation with our technological design materials. Through this process, we both collected our first impressions and learned by engaging with various communities of practice, drawing heterogeneous resources together. We see such initial material explorations where we push at the materials to see what we get back, as critical components of our interaction design practice and research. The next section takes up how we moved from these material explorations towards communicative visual languages to explain them.